Three transparent domes are currently floating in the Rotterdam City Harbour ‘Rijnhaven’. It is an exhibition pavilion that showcases floating building construction, energy efficiency and climate management technologies. Dura Vermeer, property developer and RNW Concept Design, interior development. What is the Floating Pavilion ? The recently opened Floating Expertise and Exhibition Centre consists of three semi-transparent domes of respectively 18. 5, 20 and 24 meter in diameter. In total, they cover a surface of about 1000 square meters. The building has been built in one of the city harbours of Rotterdam and is now located in the ‘Rijnhaven’. The Pavilion is accessible for professionals on request and will be opened on a regular base for Rotterdam citizens as well. Why has it been built ? A large part of the Netherlands is situated below sea level. Over the last 150 years, the Dutch people have conquered the sea to develop new land (‘polders’) and protect them with dikes and extensive water pump systems. Raising sea levels and intensified storms lead to reinforcement of existing water management structures. See also the article about The Hague on innovative dike renovation projects. Every strip of land ánd every strip of water is precious in a highly dense country like The Netherlands. The Task Force ‘Rotterdam Climate Initiative’ has been established to study building constructions in areas outside the dikes. The floating pavilion is the first result. Important objectives of the new Pavilion are to showcase ways to reduce energy consumption and CO2 emissions, in line with the Rotterdam Municipality objectives of 50% CO2 emission reduction by 50% by 2020 (1). Icon of ‘Building on water’. The new industrial sea harbour area ‘Tweede Maasvlakte’, located much closer to the seaside, has taken over the role of the City Harbours since a couple of years. Now 1600 hectares harbour area becomes available for other activities. The program Stadshavens Rotterdam investigates the development within the City Harbours of as creative new industries, public space and accommodation. Concept Studies for the new area under development ‘Stadshavens Rotterdam’ : Floating Communities, Creative Industries and Water Technology. Learning experience. The development of a ‘Floating Building’ allows architects, building constructors and public parties not only to learn about ‘how to build on water’, but also ; how to transport floating buildings’ and all other aspects related to ‘houses on water’. For instance : Who will be the owner ? How to register this ‘not-just-a-boat-but-certainly-not-a-house-either ? How to interpret the municipality city plan (‘bestemmingsplan’) that has indicated the function ‘harbour’ for this area, where now people can sleep, work or meet ? Constructed on water in the ‘Heijsehaven’, the pavillion has been transported to the ‘Rijnhaven’ quai. Who developed the Pavilion ? The building has been developed by the architect groups Deltasync and Public Domain Architects. It was Dura Vermeer who has built the building. On the 2,5 meter layer of polystyrene, floating in the Heijsehaven, the concrete, steel and foil elements have been connected. Later on, the building was pulled to its current place at the Quai of the ‘Rijnhaven’ in the centre of Rotterdam. DWA developed the installations for cooling, heating and cleaning water. RNW Conceptdesign is responsible for the interior development and development of the semi-permanent exhibition in the Pavilion showcasing new ways of building, energy production and use and water management. Rotterdam Municipality welcomes various representatives of scientific, public as well as business partners such as building constructor Dura Vermeer, Eneco and TU Delft. The special geographical situation in the heart of the city harbour, combined with the fascinating architecture and on-site showcase of new building innovation offers a great location for conferences and team building sessions (!). What makes the pavilion so special ? Floating foundation. The polystyrene foundation contains a cellar for technical equipment of 9 by 3 meters for technical equipment. By using a floating foundation, buildings can be built directly on the water and shipped to the (temporary) future destination on water. Certainly, the rest of the construction needs to be ultra-light, so the building won’t sink. The pavilion showcases a range of new innovative building technologies that assure an ultimate light structure and an optimal climate management. Ultralight light building structure : The pavilion has been built on a 2,5 meter layer of polystyrene (‘piepschuim’ in Dutch). All elements are chosen to limit the weight of the total contruction : small steel frames and ETFE foil is being used to create the roofs. Compared to a glass building, this construction is hundred times lighter. Climate management : The foil-roof consists of three layers of foil, filled with air under pressure that insulates and keeps the warmth inside the building. A part of the upper roof elements are covered with Vector Foiltec that add a layer for Ultraviolet protection (principle also used in the Beying Olympac Swimming Pool). Air convection streams are created by window opening on ground floor level and in the top of the roof. Roof and side window placement create natural ventilation and cooling by air convection streams. 1) Exhibition room : The exhibition room is a sort of ‘public open space with roof’, where people are informed about new ways of energy generation, water management innovations and building construction. This room is not extra heated, the temperature is only slightly higher than the outside temperature with an maximum teperature of 15°C. 2) Conference room : In this room, lectures and meetings are organised, for maximum 150 people. This room is heated, when used, to a confortable temperature, by using the warmth of the thermal connectors that are placed on the roof, as well as the Phase Change Materials in the walls of the room : these materials absorb warmth (liquid phase) above 21 ˚C or heath up the room when the temperature is below 21 ˚C (fixed phase). Will the pavilion stay in the Rijnhaven ? The building has been designed and built to last at least for the coming 5 years (to the contrary of other temporary floating exhibition objects that are often destroyed). If in the near future this specific quay at the Rijnhaven does not seem anymore appropriate, the building can be relatively easily transported to another water location in the next years. Artist impression of the future transport to a new destination : The floating construction allows the Pavilion to be transported to another place in the future. 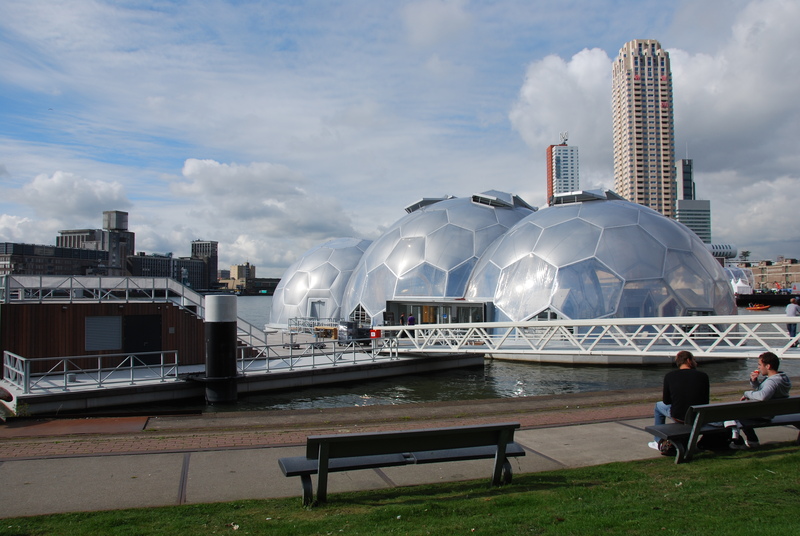 The ‘Netherlands Water Partnership’, will reside as of now in Rotterdam, with the pavilion as its icon. This national groups consists of 200 public-private-ONG organisations and aims to make The Netherlands the ‘Water-Harvard’, with projects in The Netherlands, as well as in Turkey and Singapore. I would like to thank Wouter Storm and Rob van Montfoort of RNW Conceptdesign and Wenny Hau of Dura Vermeer for their cooperation. Thanks , great blog . Good Information . ik wil wel in de rijnhaven wonen; waar kan ik me aanmelden?